Enter your The Contraceptive Pipeline Database username. Welcome to Calliope, the Contraceptive Pipeline Database! 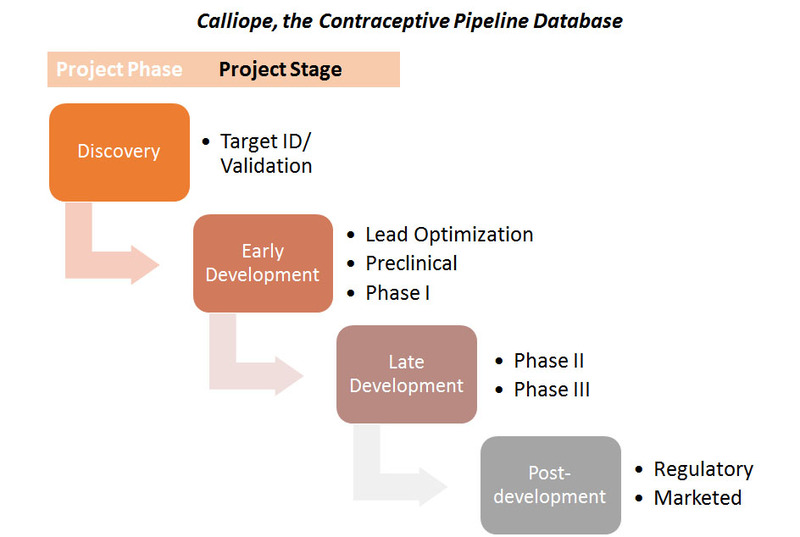 Learn about forthcoming and new contraceptive products from Calliope, the Contraceptive Pipeline Database. Please complete our user survey. The summary report includes active, limited market approval, and SRA or WHO PQ approved products by target (male/female) and project phase. A summary of products in the database begins below. This information can also be viewed in Table format. To refine the results, use the filter options on the left and then click on the “Apply” button. Use the Reset button to clear filters. Click on the name of the product to learn more. Use the hyperlinks for Target, Stage, Mode, etc. to see other products that fit the same criteria. The project phases and stages of the development pipeline are described here. Active Development - Products that are in the development pipeline and actively being worked on. Limited Market Approval - Products already marketed in limited contexts, but for which a broader market might be pursued. SRA/WHO PQ Approved - Products that have recent approval from either a stringent regulatory authority (SRA; the U.S. Food & Drug Administration or the European Medicines Agency, including the CE Mark) and/or the World Health Organization Prequalification program, but are not yet widely distributed. Inactive - Products that are stalled in the development pipeline. Calliope focuses on contraceptive products that are in Active Development; it is not intended to be exhaustive in the other status categories. The focus is on long-acting* and novel products, and those that have the potential for wide distribution in low and middle income countries. Oral contraceptives, unless they represent a new technology or API, and male condoms are not included. *In Calliope, long-acting refers to products that require administration less than once per cycle or month. Disclaimer: We strive to keep the information in this database up to date and accurate, but we cannot guarantee complete accuracy. Any mistakes that are brought to our attention will be corrected as soon as possible. Links to external websites are provided as a service. Their inclusion in the Calliope does not imply endorsement of their content by FHI 360 or any of its individual partners. Similarly, the mention of specific companies or products does not imply endorsement. Calliope is coordinated by FHI 360 under the Contraceptive Technology Innovation (CTI) Initiative with funding from the Bill & Melinda Gates Foundation. It is a part of the CTI Exchange at www.ctiexchange.org.